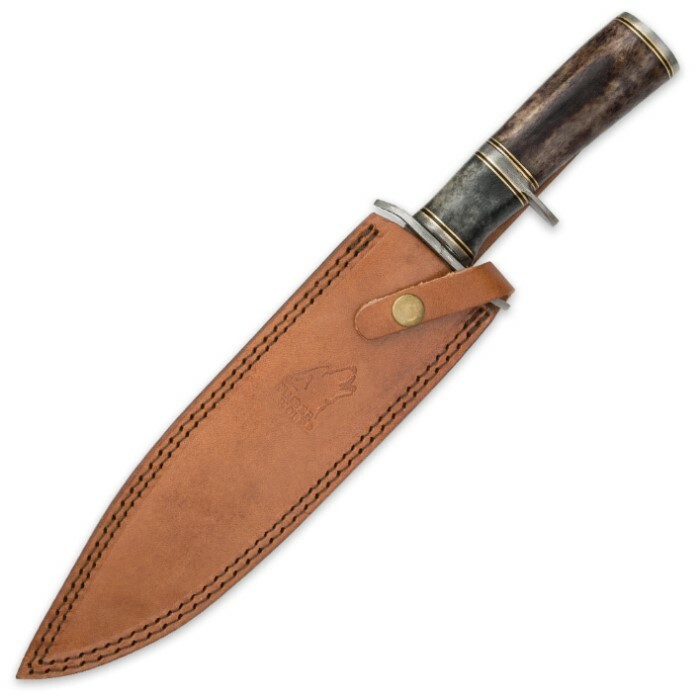 Timber Wolf Prairie Moon Damascus Bowie Knife with Genuine Leather Sheath | BUDK.com - Knives & Swords At The Lowest Prices! A dazzling mashup of textures and tones, Timber Wolf's "Prairie Moon" Bowie weds Damascus steel's maelstrom of contrasting lines and swirls with the tranquil natural grain of exotic camel bone. The result is a fixed blade knife that beams brighter than the rest, demanding attention and exuding rustic charm. But make no mistake - the Prairie Moon is much more than just a pretty face. It's impressively sized and built like a rock - born to conquer the wildest lands and the toughest cutting jobs. The Damascus steel blade is an imposing 9 1/2" and boasts an edge that's carefully honed to razor sharp, right out of the box. 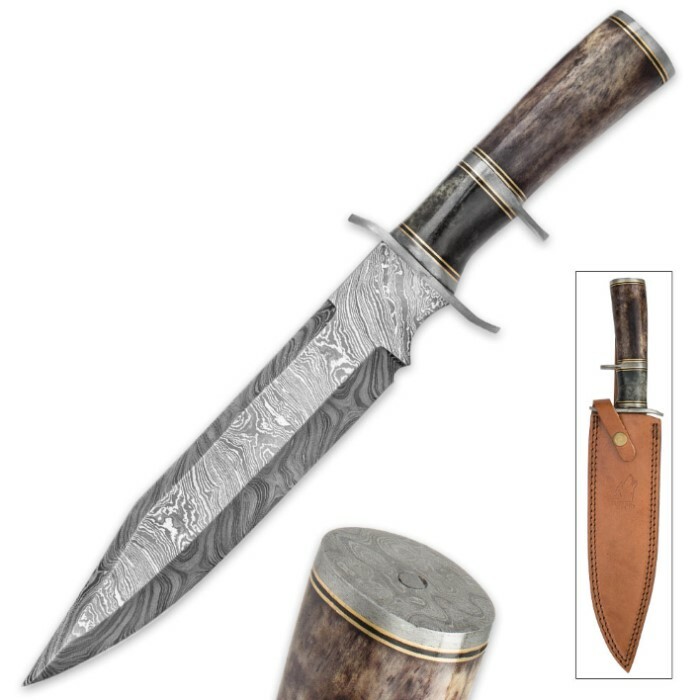 Like the knife itself, the Prairie Moon's Damascus steel is an eclectic mixture of contrasting materials - namely, two distinct grades of high carbon steel. After firing the divergent steels at temperatures exceeding 1,100 degrees Fahrenheit, master bladesmiths painstakingly fold and hammer-weld the molten metals together - repeatedly, sometimes for days on end. After much blood, sweat and tears, the bonds between the steels are rendered indivisible, and the blank becomes a single piece of rugged, resilient steel - revered the world over as one-of-a-kind "Damascus" steel. A final acid etching highlights the mesmerizing tempest of contrasting waves and ripples formed by the layered steels. It's a slow, laborious process - but one that's well worth the trouble, as each Prairie Moon Damascus blade is rugged and tenacious, subtly flexible and never brittle. Like a fingerprint, the patterning on each blade is wholly unique. Likewise, the raw grain of the camel bone handle is all-natural and one-of-a-kind. Expert artisans carefully dye, cure and stabilize the alluring bone, imparting it with a regal appearance and durability to last a lifetime. Despite its colossal 14 3/4" length, the Prairie Moon is exceptionally well-balanced and an all-around pleasure to wield. The steel sub-hilt and generous finger choils afford maximum control, making the Prairie Moon ideal for not only the big jobs, but fine, delicate tasks, as well. 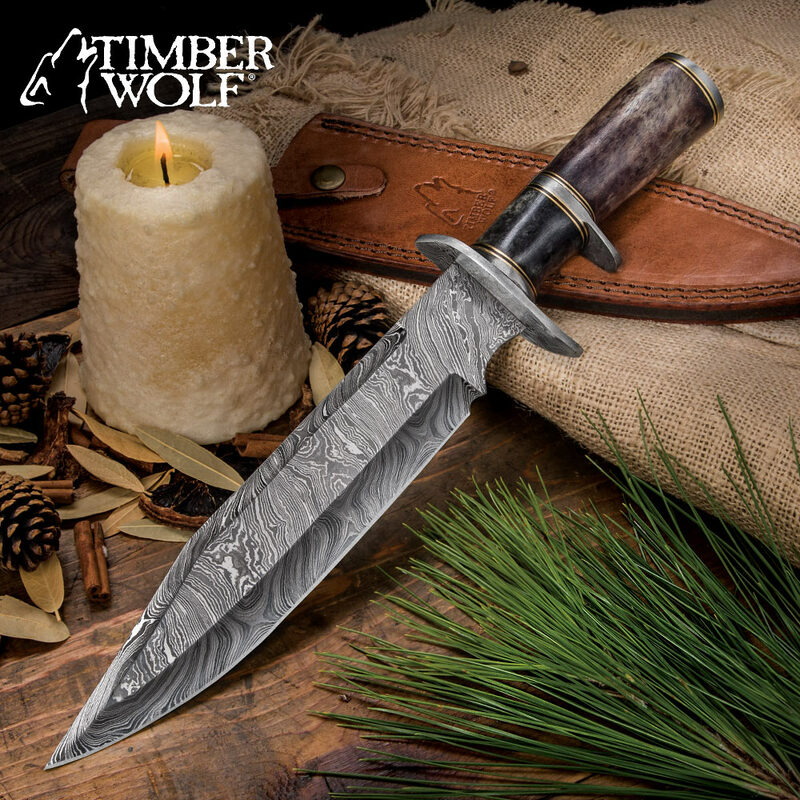 Timber Wolf's "Prairie Moon" Bowie is the epitome of unsullied beauty and raw, unbridled ruggedness. Grasping this exceptional knife is like trekking through a vast, windswept prairie on a calm, moonlit night - every strand of grass bathed in a tranquil golden glow. Simply put, wielding the Prairie Moon is a genuine pleasure and practically surreal; it defies description and is something you have to experience for yourself to fully appreciate. From open prairie to towering peak, the world is yours to conquer with Timber Wolf's Prairie Moon Bowie Knife. My review stays the same. Wonderful knife. Wanted to add that it does vary some from the picture. The picture shows it having like a ski slalom slope to it. Well ot just come at a slant. Much...much better looking than the picture I assure you. It looks like a true Bowie. Mine came in yesterday. The blade is strait, sharp, and looks great. The Damascus pattern on this one looks the best so far out of all that I have received so far. I knew before I ordered that each knifes bone handle would vary in color. I was lucky enough to get one with a greenish blue hue to it. I love it. This knife is priced right and feels good in the hand. I have purchased other knives from Timber Wolf for a lot less money and was surprised at the good quality, but not with this knife. There were alot of imperfection in the blade and the handle. It was not the quality I expected from Timber Wolf. The picture was beautiful,but was not what I received and the sheath had stains on it. This is one of the finest bowie knives I have ever seen. The 9 3/8ths Damascus blade is wide and hefty and razor sharp, the patterns in the blade are beautiful. 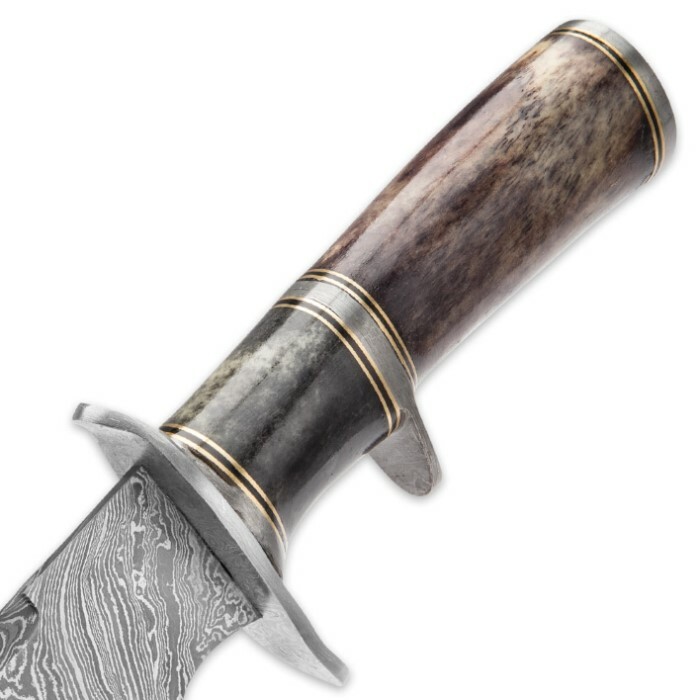 It has been my experience that Men love a Sub-Hilt knife, and the best thing about this hilt are the bone scales and Damascus guard and pommel. The scabbard is made of top grain leather and wears very well. I recommend the Timber Wolf Prairie Moon too all. Thank you.